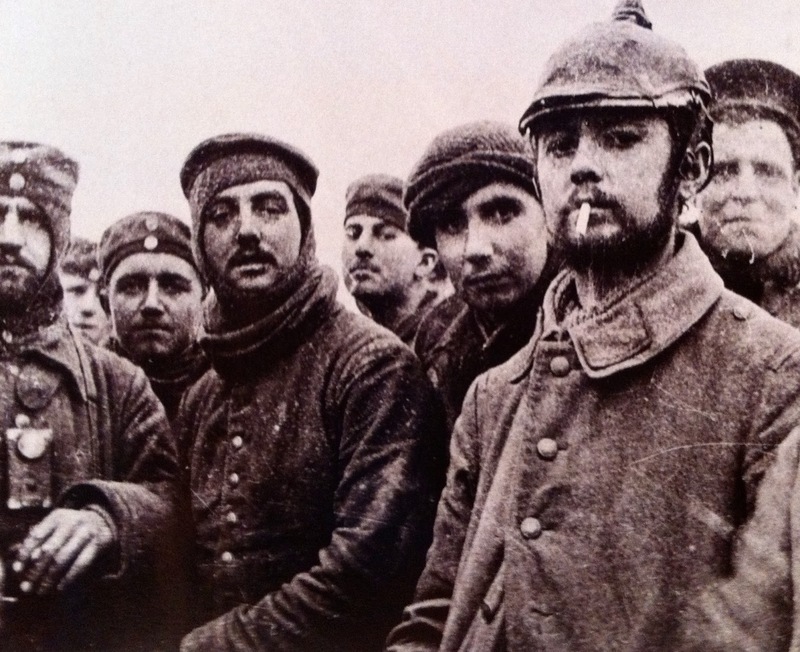 This picture was taken during the Christmas truce near Ploegstreet, Belgium one hundred years ago. The other night after hearing two amazing holiday Philippine choirs at a friend's compound, my high school son posed a question to me. We were all very moved by the experience of hearing untrained voices sound like they belonged in a European concert hall. He reflectively asked, "Mom, what am I going to do with my life after having all these incredible experiences? Sometimes I wonder after meeting all these people from all over the world, I think, "What I am going to do because I was here? How different will I be because I came to Qatar my senior year?" The Philippines starts decorating for Christmas in early September, and Christmas carols are ringing everywhere as school begins. Since it is almost Christmas and one of my favorite stories, "The Christmas Truce" is being memorialized as happening one century ago, I couldn't help but think of an answer for him tonight. I will recount the story tomorrow he has heard many times since he was a little boy. But this time, I will say that I think he would have been like one of those young soldiers in World War I on December 24, 1914 on a Belgium battlefield. He is 18 years old now, and likely the same age as many of those young soldiers on that night who decided to have peace, instead of fight--to play soccer, sing, and learn to have new friends. Yes, I feel sure he would have serenaded his enemies with carols, and placed a candle lit Christmas tree on the battle field on that Christmas Eve one hundred years ago. He knows in a profound way--even more than a few months ago-- that all people are so very similar. We all want to have a home, be loved, laugh loud, and discover and create new things. The famous Christmas truce story that happened one hundred years ago tonight likely occurred because of one individual's idea--a young German soldier who wanted to celebrate Christmas instead of sitting in a freezing foxhole fighting a war. A person or experience from his past influenced an unknown soldier to desire peace, and to rally others to instigate change. This picture was taken during the Christmas truce near Ploegstreet, Belguim one hundred years ago. It made me think that talking with people who may have different ideas or backgrounds than us, being willing to go across town or even across the street to meet someone new is so vitally important. It is never insignificant or trivial to extend oneself--to embrace another, to love in unexpected ways. Giving our children, in any way we can, a broadening scope of neighbors and others around us could be that particular experience that someday, somehow could be the impetus to bridge cultures. Perhaps it could even stop a battle--maybe a war. Whoever you are, Unknown German Soldier, who was fighting on Christmas Eve on that biting, wintry night, thank you. You might not have stopped WWI, but you brought to us one of my favorite Christmas stories. You transformed the world for one night, and in some ways, you have changed it for one hundred years ago--every time someone tells your story. And to my own wonderful son, I will try to keep fostering understanding and love for all peoples. Because when we know and really grasp that belief, we can never really be the same again--even long after Christmas. A new holiday to celebrate--National Qatar Day! Painting Together: Elbow to Elbow. Opening the Sky. Powered by Blogger.